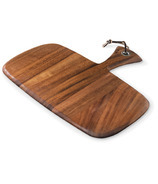 Ironwood Gourmet offers one of the most extensive fine wood lines in the gourmet and housewares industries. Their mission is to continue the development of well-designed, innovative products made with environmentally-friendly and renewable materials. They truly care about the products they manufacture and about the world we all live in. The Ironwood Gourmet product line was developed to reflect epicurean tastes in food, kitchen gadgets and the love of everything wood. The high-end product line is made with Acacia wood and Rubberwood. Acacia is an environmentally friendly hardwood that is grown on all continents and is specially known as 'chatoyancy' - it appears to change color and luster in different lighting conditions as if to shimmer. Rubberwood is both eco-friendly and one of the more durable lumbers. It has a dense grain, so there is very little tendency to warp, crack, or shrink. 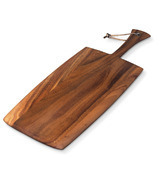 Ironwood Gourmet products are both timeless and durable. They will make a great addition to any kitchen!